Los Angeles based non-profit Girls Inc., activist Frederick Joseph, and philanthopic organization We Have Stories have teamed up to launch a GoFundMe to raise money to send girls to see "Captain Marvel" in theaters. Here's the campaign description from the GoFundMe page: "Everyone should have an opportunity to see women in roles they can aspire to one day be, roles that show women as strong, smart and bold. From a teacher to a fighter pilot—or a superhero. This is an opportunity to continue to empower girls to be just that. Marvel Studios' first female led film, "Captain Marvel" offers this type of important representation. We want to help girls from various backgrounds have the opportunity to see the film by providing tickets and renting out theaters." 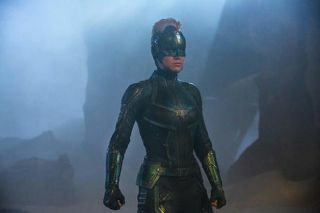 The campaign was inspired by a tweet from "Captain Marvel" star Brie Larson, which used the hashtag "#captainmarvelchallenge," inspired by a similar "#blackpantherchallenge" campaign last year which purchased theatrical screenings of Black Panther for kids, eventually raising $1 million worldwide for the effort, which Joseph also ran. "Captain Marvel is Marvel Studios' first female led film, and an important moment for representation. The lead character, Carol Danvers, is not only a superhero, she's also an athlete and fighter pilot," said Joseph in a statement. "She is a prime example of the fact that women can do anything, and there isn't a better person to be playing her than Brie Larson, who has been one of the faces of numerous feminist movements such as TIME'S UP. I am inspired by Brie and women around the globe and look forward to sending as many girls as possible to see this film." The campaign has so far raised $12,147 of its stated $10,000 goal. To learn more about Marvel's GoFundme for "Captain Marvel," visit the project's website here.